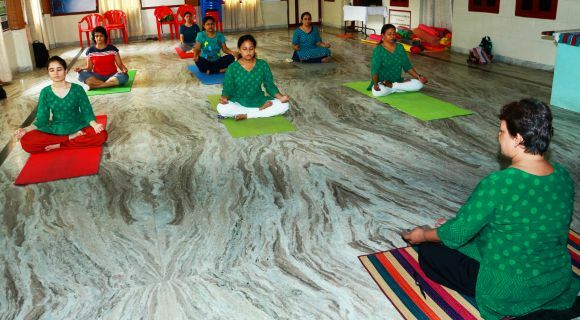 Chennai-based Indian School of Breathing founder Dr Sukanya tells Shobha Warrier how breathing and meditation are key to a happy and longer life. Breathing can solve all your ailments and make you calm, so says Dr Sukanya, founder of the Indian School of Breathing. What she offers to people to remain calm revolves around yoga and meditation. "Calm" to her is care, accept, love and meditate. "You can achieve calmness by accepting whatever life has given you, and by loving yourself and others. Through meditation, you watch your own mind and thoughts. You will see thoughts rising and then passing away. Once you become a watcher of your thoughts, you are meditating, and you are calm now," explains Sukanya. Sukanya has done her doctorate in alternate medicine and did specialisation on yoga in the Himalayas. She has also specialised in psychology and believes that "the human mind can achieve anything". It was her mother's death followed by a prolonged illness that prompted her to study the human mind and body. "After taking care of her, I understood that through willpower you can counter any obstacle. By willpower, I mean the willpower of both the body and the mind." To know more about the mind and body, she first joined the Theosophical Society of India and then many ashrams in the country including the Osho Ashram in Pune. "Vedanta taught me that the union of the mind and the body is very important to remain calm." In 2003, she started the Indian School of Breathing to make a difference in the lives of troubled people and make them physically and mentally fit so that they remain calm and enthusiastic about life. "My intention is not to destress people but make them realise that they need not be stressful at all. Life is beautiful and there is no crisis unless you create one." That is why she wants everyone to focus on the breath. "To be happy you have to understand your body and mind. For that, first you have to breathe. When you start breathing in shorter inhalation and longer exhalation, you are connected to yourself. This gives you tremendous bliss. Bliss calms down the body, blood circulation becomes normal and your mind gets relaxed. So in my school, I teach everyone how to breathe. The slower the breathing, the longer your life." Image: My intention is not to de-stress people but make them realise that they need not be stressful at all, says Dr Sukanya. She believes that breathing determines the lifespan of a person. "That is why I tell everyone to breathe slowly with longer exhalation. The philosophical way to look at this is, what you take from the universe should be less than what you give back." She believes that proper breathing changes the negatives to the positive, from shabbiness to cleanliness and disorder to order. Some of the general complaints of those who approach her are hyperactive and dyslexic children, women with infertility and menopause problems, girls with menstrual problems, etc. But what the majority of people come to her with is, stress. Her treatment starts with psychological counselling. "I tell them first that everybody has stress, but what matters is our attitude to stress. I make them approach stress differently through thinking. You need to understand the stress factor, you need to come out of it and then you need to ignore it. I teach them how to ignore stress, how to encounter it and how to come out of it." Then, she deals with stress at the muscular level through yogic postures, Reiki healing, acupuncture, etc, followed by pranayama and meditation. "This way, I am dealing with the physical, emotional and spiritual parts of a person. You have to take care of the body and mind simultaneously. Yoga postures nourish the body, breathing nourishes the emotions and meditation nourishes the soul. The approach has to be holistic." Thousands of people have approached her for help and she says the best gift she could give them was to "help them live, live a full happy life aware of everything around them. You accept your life first, and once you accept your life, you will live your life fully and then you will be happy. What more do you need in life than happiness?"